Liz is a project director at CompassPoint, where she leads our public training program. As project director for the public training program, Liz will lead the process to reimagine our public program so it can continue to evolve in deep alignment with our vision and values. Together with a team of CompassPoint practice members, she’ll also design and lead a process to develop a core programmatic approach to our entire body of work. Liz is committed to economic and racial justice for all communities. She has over 15 years of national and international social justice, youth and community organizing, popular education training, and policy and advocacy experience. Liz has served as the Senior Manager of Health Policy with the Greenlining Institute leading advocacy efforts for affordable and accessible healthcare for California's communities of color. She served as a National Training Director with the Praxis Project; a Washington, DC based intermediary organization focused on economic and racial justice. Liz fought for educational justice and finance reform for California’s public school students through the Kids Count campaign of Youth Together. 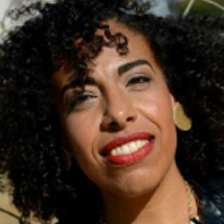 She led the very first West Oakland Youth Center Planning and Development Project in collaboration of Leadership Excellence and the City of Oakland and returned to serve as its inaugural full time Executive Director. As the Educational Program Coordinator for SOUL, she led national training programs in popular education and youth and community organizing. She is an alum of the Movement Activist Apprenticeship Program of the Center for Third World Organizing. Liz is an avid social justice writer and has been published on Feminist Wire and A-rab.net. She is a narrator of a film produced by Freedom Archives on the history of international social justice movements. She has served on the board of the Africana Institute of Penn State University and the Arab Resource and Organizing Center in San Francisco, and serves as an Advisory Committee member with the Center for Political Education and a board member of Cooperation Jackson.